Before we arrive, his manager, Hex Murda, warns us that the producer's setup is "minimal." It's hard to say, precisely what that means in these days of bedroom superstars, but we've done our best to tamp down expectations in the wake of our visit to the sprawling analog forests of John Vanderslice's Tiny Telephone studios. Black Milk moved to Dallas from his native Detroit roughly eight months before, to a relatively quiet street 10 minutes from downtown. In spite of having lived in the space for the better part of a year, the apartment has that just-moved-in feel. There aren't many places to sit, unless you're willing to set up camp on top of one of the stacked boxes of Synth or Soul 12-inches he and his girlfriend are packing up ahead of the upcoming Record Store Day. Not exactly the sort of studio environment one anticipates when visiting one of alternative hip-hop's leading producers / MCs with a resume that includes the likes of Slum Village, Guilty Simpson and Jack White. "I'm thinking of extending the studio out there," he tells us. At the moment, there's not a lot in the common area, save for a couch and a TV he says he never really watches. It would be ideal for some additional recording equipment and the drum set he left back in Michigan, assuming the neighbors don't mind, that is. For the time being, however, it's ground zero for Black Milk mail order -- buy something through blackmilk.biz, and there's a pretty good chance it'll be boxed up and shipped out by one of the apartment's two residents. The studio's on the other side of the apartment -- it's more of a den, really, a workspace with a large flat-screen iMac serving as its centerpiece. 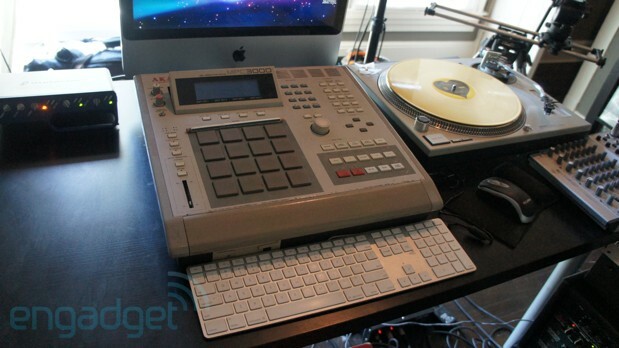 Sitting directly in front of the iMac, sandwiched between the monitor and keyboard is Black Milk's baby, the MPC3000, Akai's beast of a drum machine / sampler whose pads have clearly been well-loved. "I prefer that more analog, more hands-on physical approach," he says, motioning to the circa '94 board in front of him. I want to actually feel the buttons and the pads. I even like how this machine looks. Like it makes me want to work. 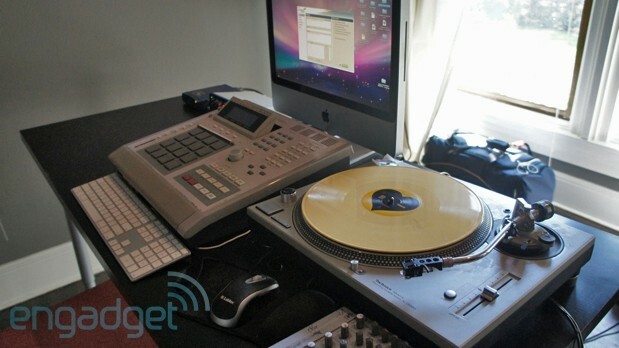 Not just because it's an MPC3000 ... coming in a room and seeing this is like, to me, I feel like this is a piece of art." To its right is a Technics turntable, sporting a cream-colored vinyl copy of his Record Store Day offering, most likely pulled out for the benefit of our cameras, much like the two analog synths in the left corner of the room, a Korg and a wood-paneled Minimoog Voyager. To his right is a record cabinet, a schizophrenic collection of LPs, from Vangelis to Sesame St. Live, the latter of which he's used to sample applause. There are a few mixers scattered throughout, and a rack of knobs he admits he fiddles with obsessively during the mixing process. Hex wasn't lying. 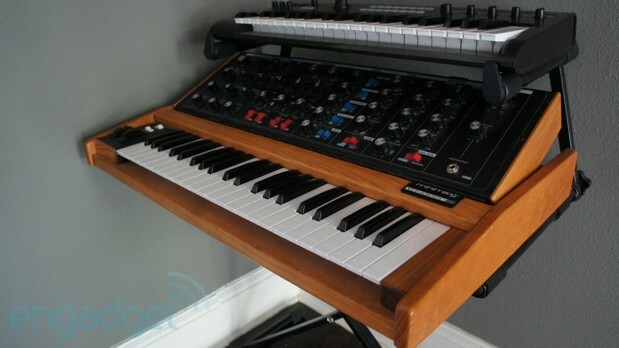 It's a simple setup for one of the most sought-after indie hip-hop producers around, but it does the trick. "I had to strip it back down because I had a lot of stuff going on in my studio back in Detroit and I'm getting a lot of that stuff shipped here, little by little, piece by piece," Black Milk explains. "I have my rack, my drum machine, my records and I'm good to go." He produced Black and Brown here, a collaborative EP with fellow Detroit native Danny Brown and laid down the tracks for his own forthcoming solo record, using a mic that's currently stashed in the closet. But while the iMac is occupying some premium desk real estate, he insists that computer production like Pro Tools is more of a second line of defense. "I don't mind the digital aspect of making music, but I like to feel everything," says Black Milk. "I'm so hands-on with everything I do. I want to turn the actual knobs, versus EQing on a computer screen. I still do a lot of my editing in Pro Tools, but yeah, by the time it reaches it, the track is already pretty much sounding good." Black Milk's love of the tactile dates back to his earliest interests in hip-hop, a passion that began back in Detroit, as his older cousins and their friends started MCing. "I took to it and started rhyming," he says, with a hint of nostalgia. "My older cousins making music on their little cheap equipment they, you know, had at the time. And I just kind of got drawn to that part of it more so than standing on the MC side of it. It seemed like I was paying more attention and putting more energy into the production side of it." His collection began in earnest, amassing old equipment purchased from his relatives. "It was like, 'Yo, I'll buy that from you; you use it every now and again, but I want to get on this beat s***,'" he says. "I researched what machines [I needed] and [bought] little drum machines and other samplers here and there. I come from like this school of hip-hop production like the Pete Rocks, the Premos, the J Dillas, so a lot of my stuff is sample-heavy so I was really into digging for records. You know, just being at the record store around the neighborhood and just digging and digging, and bringing it back and sampling. " 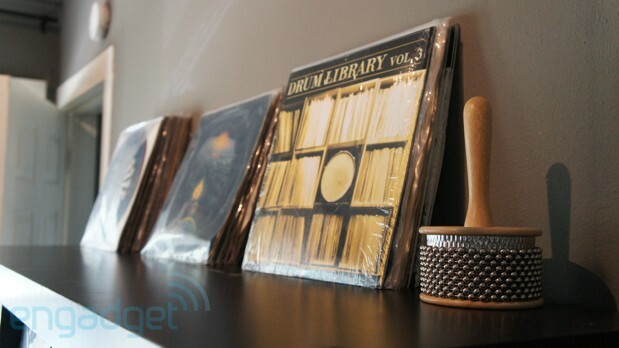 His record wall stands as a testament to his passion for crate digging, forever a cornerstone of hip-hop production. It's a process that, for Black Milk, begins with acknowledgment of the lost art of the record sleeve. "It definitely starts with the art design on the cover," he says. "If the album art looks real crazy, and the artist or the band's wearing funny clothes, or making funny faces, [I'll put it] to the side. Most likely they're some weirdos and they did some weird stuff musically I might be interested in." Like just about everything else, Black Milk's got the whole process down to a science. "When I go a record store I haven't been to yet, I just walk around before I even touch one record for probably a good 10 to 15 minutes and just get a feel for the store," he says. "After that process, going through all the genres and picking out stuff, I take it to the turntable. I try to go to record stores that have tables already in there so I can listen to [records], or I might tug along a little portable turntable." It's all much simpler if he happens to be in Rotterdam, where the owners of the Demonfuzz record shop lock the doors and turn the store over to him. It's not every day an American hip-hop producer gets to the Netherlands, of course, so you've got to take music discovery where you can get it. And while Black Milk still prefers the analog warmth of real-world situations, as with production, sometimes computers will do in a pinch. "I found a lot of jewels on sites like YouTube. I started making YouTube a place where [I crate dig] like at the record store. I use that and apps like Shazam. When you're in a restaurant, and some music comes on, or you're in a theatre and you're watching a movie, and there might be something playing in the back. That just happened to me a month ago, and I had to Shazam some song in the show. It was a ridiculous joint." But those small surrenders to the purely digital world are begrudging for Black Milk; his is still a world informed by the production standards that gave birth to Motown and the Beatles. "I just love the analog stuff," he says. "You know, even with--" he breaks off, excitedly, and walks over to the closest, where even more equipment is stashed safely out of sight, pulling out a small box with a large grin beaming across his face. "I just bought this little drum machine, this little Casio RZ1. It's kind of some bulls***, but it gives you that 12-bit sound. So whatever you sample into it, it's going to put that 12-bit grit on it. " It's a preference that makes Black Milk something of an anomaly amongst his peers. "It's rare to find cats, especially younger producers, that come from that school of production, because everybody, you know, we're in that time where everybody wants everything to be convenient, fast," he explains. "But when it comes to my music, I don't mind taking time." Video segment originally appeared in Engadget Show Episode 43.